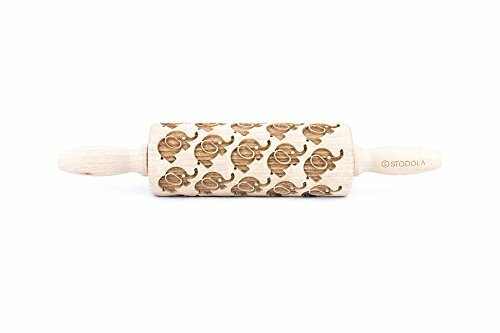 Wooden rolling pin for making cookies engraved with animals patterns. This rolling pin is engraved with a laser machine. It is made of high quality beech wood. It is cleaned and impregnated with a safe for food oil. It is beautifully packed with care to every detail. This can be a great gift for a close person, or just for your home baking. For any occasion! The dimensions of rolling pin are as follows: 43 cm of length (with the handles) and 6 cm of diameter. Please keep in mind that wood is natural material and you can find small imperfection (color changes etc.). Wooden rolling pin for making cookies, perfect for rolling out cookie dough, pies, and fondant. This Rolling Pin Measures 9 x 1.5-inch of solid beech wood. Perfect gift for housewarming, Christmas, anniversary or any occasion. If you have any questions about this product by STODOLA, contact us by completing and submitting the form below. If you are looking for a specif part number, please include it with your message.